Stanbridge College Nursing Instructor, Anne Garrett, RN, looks at a CT scanner and thinks of it as if it were a space ship in Star Wars. According to her husband, Haydn, Mrs. Garrett can understand how “little people” think. With eight grandchildren, ages ranging from three to twelve, she would often write stories to them about nurses, doctors and hospitals. Because of this, her husband urged her to write down ideas for a children’s book. Out of those ideas came “My Tummy Hurts,” a book about a child named Sam, who goes to the hospital because of a stomach ache. Sam, with his Transformer toy robot by his side meets with doctors and nurses who wear Superman printed scrubs. Sam also goes through procedures such as getting a CAT Scan. “I know what the adults go through, when they are scared, hurting and unsure of outcomes, so I wanted this little boy to understand what could happen to him, from the ER to the operating room to recovery and discharge,” said Anne. With 46 years of experience in the nursing profession, Anne anticipates that her recently published book will help alleviate any fears that children may have when visiting the hospital. For example, in the book, when the doctors ask the boy to get in the CT scanner and stay very still, the boy thinks of it as though he is stowing away on space ship, just like Luke Skywalker did in Star Wars. 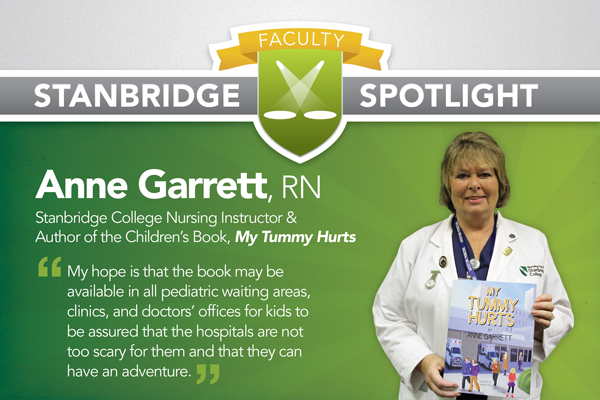 While her book teaches children what to expect as a patient in a hospital, Anne continues to teach young aspiring students how to be nurses in the Vocational Nursing program at Stanbridge College. As a nursing instructor, Anne feels that it is important for nursing students to be excited about their future careers. She believes that there will be a constant demand for nurses and urges new nursing students and graduates to continue their education throughout their careers.